Have you ever got so attached to a specific taste, that you really want to recreate in all the dishes you can? For a couple of days now, I can’t stop thinking about an ice cream I ate two years ago.. I know, I must have really liked it, hahah.. that had an amazing basil and mint flavour (for my Romanian readers, I am talking about Creamier in Bucharest, and I really hope they are still open and serve the same flavours). Umm.. I can still remember that hot Saturday morning, randomly wandering the streets and stopping here by pure chance. This could easily be your power breakfast, a light snack in the afternoon or an innocent dessert after lunch. Or you can go for all three in the same day, and you won’t feel guilty. For the sake of the low fat diet (or better say, good fat diet I am concentrating on), I decided to go for a lighter greek yoghurt with 6% fat, which still holds on the taste and creaminess, but cuts a bit on the calories. And if you are dairy intolerant or just want to avoid the yoghurt altogether, you can replace it with coconut milk or cream, and you can still enjoy a good and diet friendly dessert, but be ready to go for a more exotic taste 🙂 Uh la laa! But if you stick to this recipe, the freshness of the mint with the sweetness and rose aroma of the raspberries make a perfect combo on a warm spring day. I love enjoying chia seeds once in a while, especially as little snack between meals, as they cut all the cravings I have for something sweet or even hunger, offering my body a good source of antioxidants, omega-3 fats, essential minerals and high intake of protein (16.5 grams/100 grams of seeds). Actually, chia seeds are proved to be the best known plant-source of omega-3 fatty acids. Here are the steps on how to make the double layered chia seeds pudding. Divide the greek yoghurt in 2 equal parts. Use a blender to mix the 2 parts, one with raspberries and the other one with the mint and basil leaves, for about 2 minutes each, or until they reach a creamy consistency. Now incorporate the chia seeds, 4 tsp on each yoghurt mixture, and the honey, divided between the parts of pudding. Give it a good stir and set aside for 15 minutes in the fridge, or until the pudding reaches a thicker consistency. 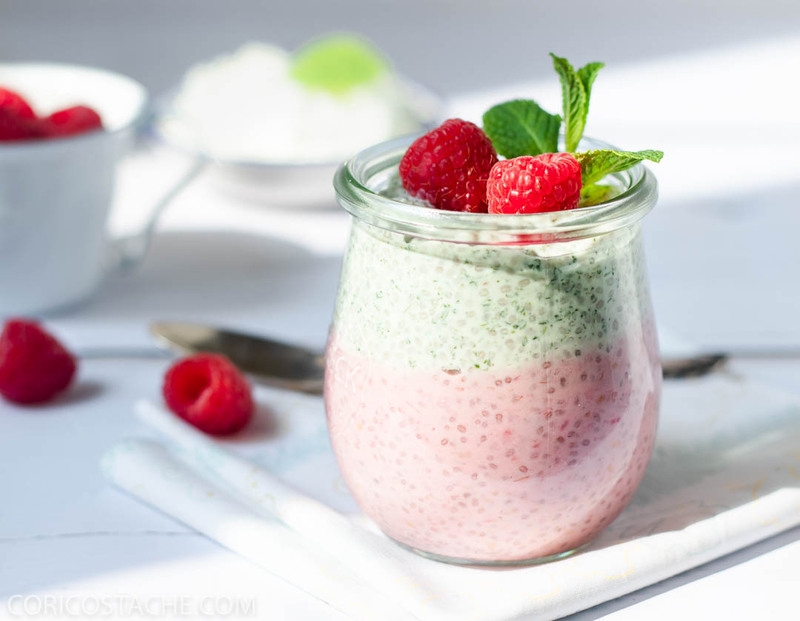 Assemble the chia seed pudding in the jar starting with the raspberry mixture. 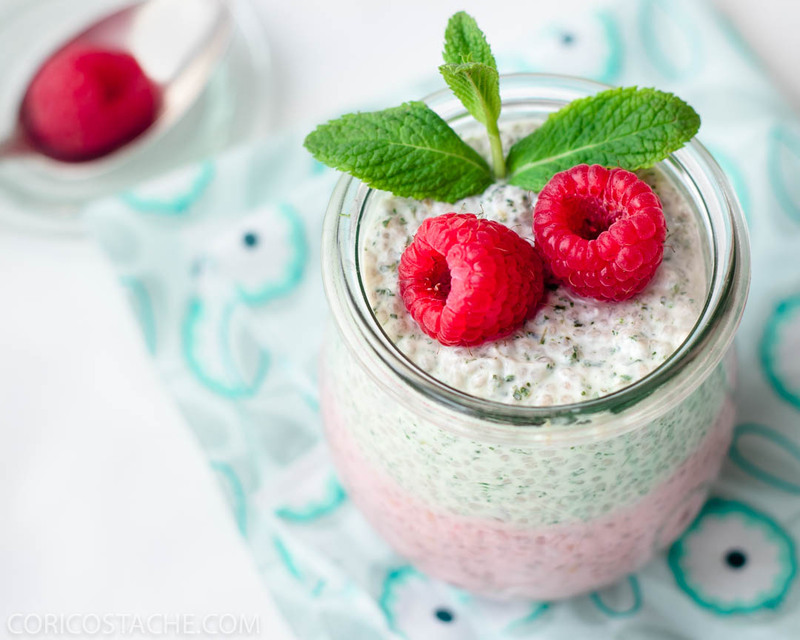 This chia seed pudding looks delicious and easy-to-make. It’s a nutritious dessert. Thanks Joanne for stopping by!